Stay in the middle of vibrant Copenhagen in the hip Vesterbro, where classical architecture from the 1880s meets trendy decor. Here you will be close to restaurants, bars and small designer shops. We are just a few minutes’ walk from Tivoli Gardens, the Central Station and shopping in Strøget (the pedestrian area). Do you want to stay in Vesterbro, the most popular part of Copenhagen? Then hotel Scandic Webers is the right hotel for you. Here you can follow life in the city from our cocktail bar Cube while enjoying a tasty drink or a snack. In the summer, our cosy courtyard is a popular place to meet friends or colleagues over a refreshing drink. We are happy to arrange your next meeting or conference in one of our 3 meeting rooms which, of course, include modern audiovisual equipment and free WiFi. Our hotel has a small number of bicycles, providing you with a great opportunity to experience Copenhagen alongside the many local cyclists. If you want your heart rate to increase, we are close to the Lakes, home to one of the most popular running trails in Copenhagen. If you arrive at hotel Scandic Webers by car, you’ll find parking in the nearby streets. We also collaborate with the multi-storey car park, Saga P-hus, approximately 100 metres from our hotel. This unique city hotel is located in the centre of Copenhagen in the neighbourhood Vesterbro. In hip Vesterbro, you will find everything from gourmet restaurants and bars to small, quaint shops. Remember to visit the biggest tourist attractions in Copenhagen, such as Tivoli Gardens, Strøget and Rundetaarn, all within walking distance of our hotel. At our reception, you can purchase discounted tickets for the best attractions in Copenhagen. Our hotel is just a few minutes from Copenhagen Central Station and from here you can catch trains to Copenhagen Airport, Kastrup. At the Central Station, you can also catch buses and taxis at any time. If you're arriving by car to Scandic Webers, you'll be able to find parking in the nearby streets. In addition, we have an arrangement with a nearby indoor car park which also offers plenty of parking. Keep fit during your stay at Scandic Webers with free access to the nearby Scandic Copenhagen hotel's fitness centre and sauna. Visit our hip and trendy bar to relax for a while. It's difficult not to feel welcome. In the morning, we put a little extra time at the breakfast buffet for you to get a good start to the day. 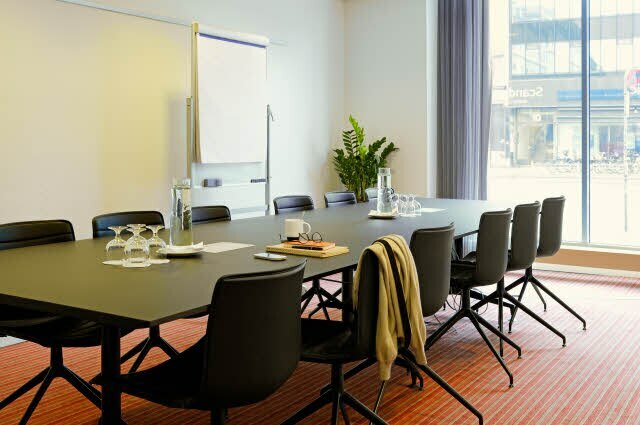 Hold your next meeting at hotel Scandic Webers. Our hotel offers 3 meeting rooms featuring comfortable chairs and soundproofed rooms with a view over Vesterbrogade shopping street.